Marie Kuncl Matthes, 103, of Iowa City gently passed away Thursday, January 17th at Willow Gardens Care Center in Marion. Mass of Christian Burial will be celebrated at 10 AM, Wednesday, January 23rd at St. Mary’s Catholic Church, Iowa City, with Father Steve Witt officiating. Visitation will be held from 8:30 to 10 at the Church where a rosary will be recited at 9:30 AM. Burial will be at St. Joseph Cemetery. In lieu of flowers, the family requests memorials to St. Mary’s Catholic Church, Atrium Village in Hills, or Hospice of Mercy, Cedar Rapids, IA. Marie was born on October 16, 1915 to Francis and Elizabeth (Schumacher) Kuncl in Portsmouth, IA. She married Robert B. Matthes on Valentine’s Day, 1941 at St. Mary’s Church in Iowa City. They moved to Van Buren County in 1943 where they farmed until 1957, then returned to Iowa City. They were both employed at the University of Iowa. Marie was employed in the Otolaryngology department at UIHC, retiring in 1977. Marie volunteered at Senior Dining, Mercy Hospital, St. Mary’s Church, and wherever else a helping hand was needed. She was a member of the Catholic Daughters of America and served a term on Hill’s Atrium Village Board of Directors. 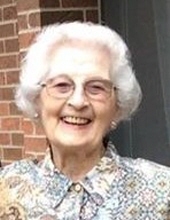 Marie returned to Atrium Village in 2008 where she maintained her independent apartment and enjoyed her daily walks with special friend, Ruth Donner, until early December 2018. Marie was a kind and gentle soul who was an inspiration to all. She will be greatly missed. She is survived by her son, Tom (Pat) Matthes of Marion, IA; grandson, Darren (Cindy) and great granddaughters, Maren Deborah Matthes and Kate Elizabeth Matthes, all of Sioux Falls, SD; step-siblings, Jeanette (Rich) Lalor and Jerry Kuncl; also, many friends and relatives. Marie was preceded in death by her husband, Bob, in 1992; granddaughter, Deborah Matthes in 2003; siblings, Irene (Ed) Knoedel, Patricia Kreeger, and Bob (Barbara) Kuncl. Special thanks and appreciation to Willow Gardens Care Center, Marion for their kind and compassionate care. To send flowers or a remembrance gift to the family of Marie Kuncl Matthes, please visit our Tribute Store. "Email Address" would like to share the life celebration of Marie Kuncl Matthes. Click on the "link" to go to share a favorite memory or leave a condolence message for the family.